It was, it has to be said, the perfect day for it. I knew because Jeff Archer, the man partly responsible for Florida’s stand up boarding craze, said it was. He calls it YOLO (You Only Live Once) and I was about to be a YOLOist. The lake was glass still, the reflections of Florida’s swamp grass mirroring in the smooth water. A slight breeze wafted its way across us, and a curious pelican hovered, perhaps looking for a juicy morsel or two for lunch. All then was well with the world and I was well and truly up for it. Yeah right. Jeff was of course completely unaware of my previous disastrous attempts at windsurfing and skiing; clear evidence that my ability to balance is entirely questionable. Let’s just say I was less confident about Jeff’s guarantee than he was. Nevertheless, I wasn’t to be put off, as I earlier I had watched two ladies of a pensionable age take to it like ducks to water, their shrieking and cackling echoing across the open water without even a hint of a nervous tremor. So, looking more like a crab than a budding YOLOist, I crawled sideways on my stomach off the pontoon into a kneeling position on the floating board as instructed. Maybe this was the perfect opportunity for a quick pre YOLO prayer I thought to myself. Well, kneeling there it seemed more than appropriate, so a silent wish was sent . Then, still kneeling, (or hanging on for dear life depending on your perspective) I took the long paddle in a vice –like grip and pushed off into the lake to face my fate. Jeff of course, followed behind, standing proudly astride his board like a Greek god as he cut through the water and I hated him more than anything else in the world for just that moment. Envy can do that to you. “Ok now just stand up, it’ll be fine”; he called over to me after a few minutes of watching me still kneeling, blindly paddle around in an endless circle. Okay I might have been going round in circles, and it might not have been pretty to watch, but I was getting used to the feel of the board. But it seemed the moment had come and there was no going back now, so I did. I stood. In that moment, two things happened. I stayed upright and, despite mentally planning to look as graceful as possible as I plunged headfirst into the water, I continued to stay upright. It was a defining moment and a gloriously triumphant one that will live with me forever. Now I was really standing up and gliding across the lake. Suddenly, I was taking in all the beautiful natural surroundings and not even thinking about my balance. And beautiful they were, a mix of everglade swamp, pampas grass and tropical fauna surrounded by crystal clear water and echoing birdsong. It seems I was YOLOing just as he said I would be, and I was loving every moment of it. So this then is YOLO boarding. Something you can learn in minutes and have hours of fun with, no wonder it’s become North West Florida’s must do water sport. Young or old, thick or thin, YOLO fever is rampant. Standing for You Only Live Once, YOLO is the brainchild of two young entrepreneurs Jeff Archer and Tom Losee; two surfer dudes who saw the mass appeal of a stand up paddle board that was a cross between surfing and canoeing. Using a side to side canoe like paddle action, YOLO gives you an upper body work out at the same time as providing the thrill rush of gliding through the water amongst some of Nature’s finest scenery. It’s a little tougher when you’re paddling against the water’s natural flow, having to get that paddle cutting deeper into the water, but there’s no rush and you can take your time building up a head of steam. And with just a quick thrust in the opposite direction to your flow, the paddle doubles as a brake or to help you to turn in a tighter circle than you would normally. .
And that’s true. 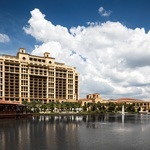 Florida is blessed with some stunning coastal waters and dune lakes, particularly on the Gulf coast and the Intracoastal Waterway, whilst inland around the Polk County area just next to Orlando, there are literally hundreds of large natural lakes and parks too. The success of YOLO is due in no small part to the competitive nature of Americans when it comes to sport and water sports in particular. It didn’t take long for the sport to get competitive, with a number of major competitions springing up giving the now expert YOLOists opportunities to show off their new found skills on the ocean surf and inland. 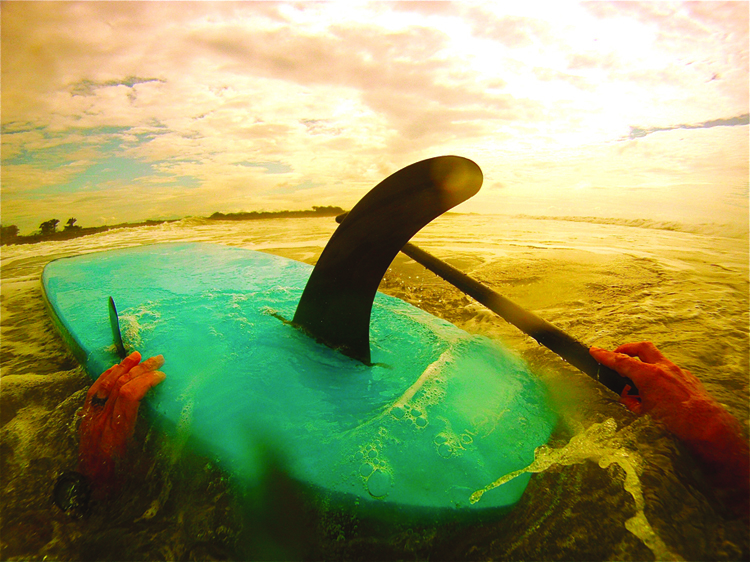 And to support the growing numbers of skilful enthusiasts, YOLO has developed a range of boards specifically for various water sports and competitions. From the original YOLO which was twelve feet long and nearly three feet wide, there is now the shorter and lighter YOLO Express, the bamboo inlaid YOLO Explorer complete with bungee harness and air valve release system for fishing and boarding at the same time, the narrower YOLO Eco-trainer for maximum work outs and the ultimate competition-ready surfing flyer the YOLO Prowler, a fourteen foot carbon fibre beauty designed by surf legend Steve Brom for lovers of the white foam wave. 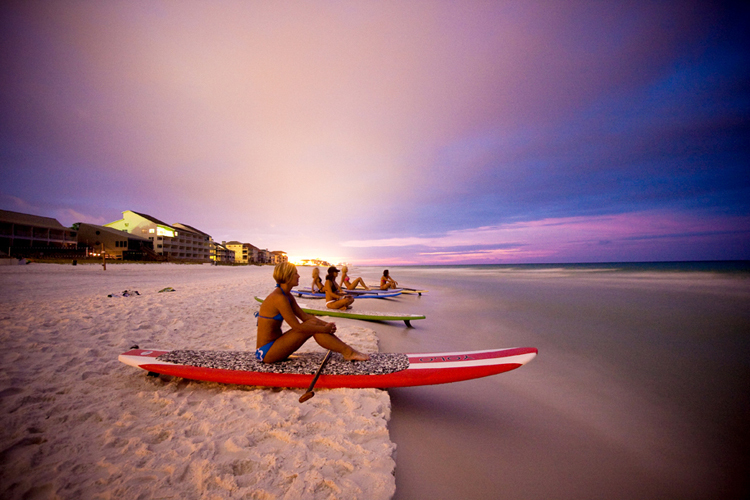 There are boards that can be used for fishing, for cruising along the coast, diving and snorkelling and even tandem paddling. The list of possibilities seemingly endless. As for me, I couldn’t wait to get out on the water again, doing YOLO solo, now looking god-like myself, confident and purposeful astride my YOLO board with just the wind and the birds as company. Stand up boarding is highly addictive and my new best friend, now where did those two pensioners go, I want to show off!! How much does it cost to YOLO? 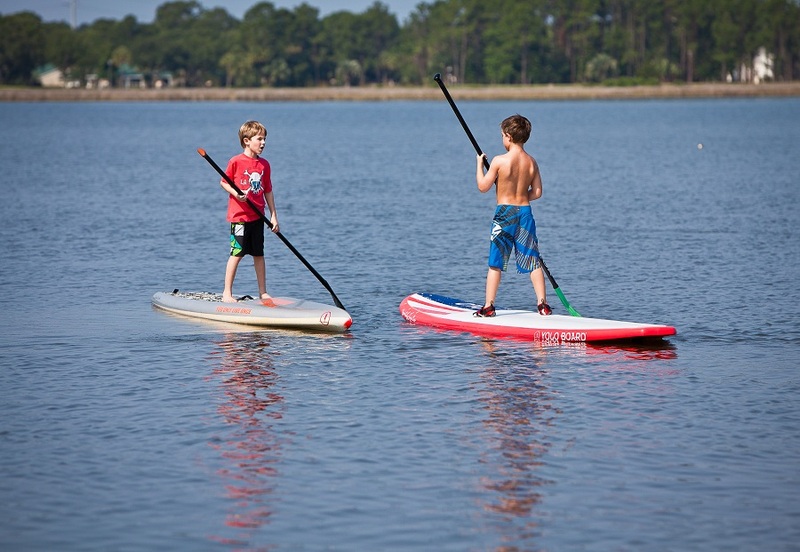 You can rent a YOLO board by the hour from just $35 or $75 for the day or get private and semi private tuition from $50 for 2 hours at a number of exclusive YOLO distributors throughout central and north west Florida.